My goodness did Ponder have a terrific game against the 49ers. The Vikings obviously came to play, and it showed right out of the gate. Ponder has quietly put together a really nice start to the season and should be considered for bye week fill in duty. It’s also worth mentioning that Ponder goes up against a porous (thus far) Detroit Lions defense. If Stafford is out for any amount of time, Hill deserves a look. He’s got tremendous talent around him and has shown to be a very good quarterback when given the chance. Also a nice pickup in two quarterback leagues if he makes a start. Was poised to be the number one pickup but word out of Buffalo is that Fred Jackson is likely to practice this week and it was good news on CJ Spiller’s shoulder. CJ has also come out and said he isn’t ruling himself out this week, but it’s unlikely he plays. If Choice ends up getting the start he will be fantasy relevant in week four. Buffalo does play an early game this week, so you will know what’s going on in terms Jackson and Spiller being active or not. Did he finally break out? Maybe. The Eagles do have an improved defense and Ryan Williams ran pretty well to ice the game away for the Cards. I have always liked his skill set but he just had a horrible start to the year. Beannie Wells may have a turf toe issue, so Williams’ door could be bursting open. Just in case you are in a league that didn’t pick him up last week… now would be a good time. With Reggie Bush getting injured Daniel Thomas could see a lot more time for the Dolphins in the backfield. The second year player does have the skills, but it’s been his lack of assertiveness that has clouded his young career. Early indications are that Reggie did not sustain any serious injury though and could be ready to play this week. Jerome had been on a 3-game suspension to start the season, but he could be the key to opening up the Vikings offense and may make Percy Harvin’s life easier. Simpson can stretch the field better than any other receiver on the team and will likely get his opportunities down the field. Everyone saw Barden blow up on the Carolina Panthers Thursday night. If you are in a league that locks free agents for the week after they play, it’s time to put your claim in for Barden. Even as a third receiver when Nicks comes back, Barden should have a few nice games. Just don’t count on every week production. I have never thought of Miller as a viable fantasy option. Maybe a bye week fill-in but the guy is balling right now. He has a score in each of his first three games and Big Ben has looked his way quite a bit. The Steelers are on bye this week, so it’s possible that you could wait on him till next week if you have your eye on another player for your first waiver. I almost can’t believe it. This is the third Viking player on the pickups this week. I guess, if you beat one of the best teams in the country, you are going to get noticed. Congratulations Minnesota! But honestly, Ponder is looking his way for good reason, Rudolph is a huge target with good mobility. He nabbed 2 touchdowns against the Niners this week. I saw on Yahoo that they were owned in around 30% of leagues. That really is going to change this week. They went on the road and stifled one of the best offensive minds in the league. Nor Turner is still on the field trying to figure out what happened. So now that you have the information, the time to act is now! Reblogged this on Excel for Fantasy Football ©. I invite you to latch on at the new site. Let me know what you think! We have weekly rankings, Monday reaction, waivers, injury reports, live Q&A’s and much more! I need to write a post here to remind everyone! Great article, but I need to know the pickups for fantasy football Week 15. Are you going to be writing any more? Hey Justin, I actually have moved on to a bigger and better site called the FFLockerRoom! 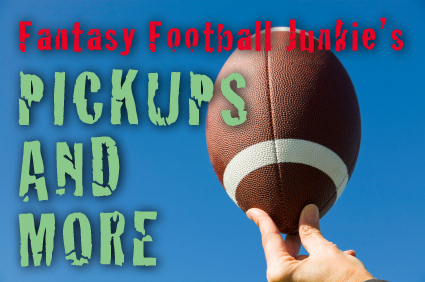 There I handle the weekly Waiver Wire, Weekly recap and rankings for RB’s and Def’s. Thanks for asking! Feel free to make it over to the new site and leave me some feedback. Always eager to talk fantasy football!